Ms. Sahrin is a biochemist with seven years research experience in the field of infectious disease. Her academic and professional experiences have enabled her to develop technical skills in the field of microbiology, immunology and project management. She won Sida (The Swedish International Development Cooperation Agency) research grant on the enhancing diagnosis of extrapulmonary tuberculosis and establishing a follow-up tool for monitoring of extrapulmonary tuberculosis affected person treatment outcome. 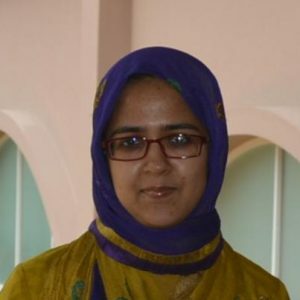 After obtaining her MS in Biochemistry and Molecular Biology from University of Dhaka, Bangladesh, she joined at International Center for Diarrheal Disease Research, Bangladesh (icddr,b) and gained a efficacious research experience on tuberculosis epidemiology.